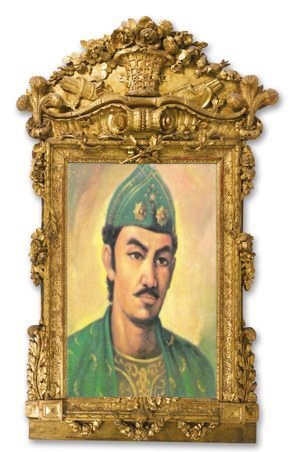 Palembang is a city in Indonesia, the evidence can result in the discovery of the inscription Kedukan Bukit found by local people, initially as an inscription stone is trusted by the magic power of trusted and prosper, one of the evidence at the time the race was held bidar stone placed in the boat's bidar and turns that brought rock bidar reach victory, whether it is just coincidence or is true we do not know. But victory is trusted by the residents of the stone. In the year 1920 a stone was submitted to a Dutch Controluer called M Baternburg and then translated by expert archeologists some experts of which is derived from the archeologists called Prof. Francis. Goerge Coedes.dari palembang start here known by many people all over Indonesia and Manca palembang is because the country's central Kingdom Sriwijaya, based on the results of the translation is marked stone (Kedukan Bukit Inscription). 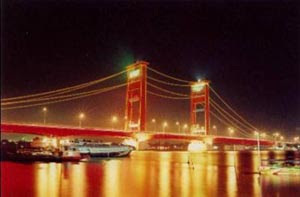 Palembang is not only rich in terms of history but, Palembang also has a variety of cultural heritage that is the ancestor of the era of Sriwijaya Kingdom and also the cultural heritage of the Sultanate period, the majority culture palembang influenced by Chinese culture both in terms of buildings, art, clothing and culinary. kesungai, marked by the addition of the roof and pyramid-shaped horn, or be like a claw is a claw dragon. Building a house is usually aft pyramid to the back. There are buildings that measure 20 meters wide with a length of 100 meters. Home the pyramid symbolizes the social status of home owners. Usually the owner is a descendant of the family Sultanate of Palembang, Dutch East Indies government officials, or wealthy merchant., Which was established over the poles of wood or unglen Ulin is strong and resistant air.Dinding, doors and floors are generally made of wood tembesu. Are used to order timber cool. Each house walls and doors, especially given the ukiran.dan in the cat with the parade of gold shipped from the original Chinese land. lamp and hanging as antique accessories. The terrace house is usually surrounded by a fence of wood berjeruji called tenggalung. Philosophical meaning behind the rail fence is to keep the child so that women do not leave the house. Entering the home, the entrance to the home of the pyramid is unique. Timber doors are opened wide when akan stick to the roof terrace. To menopangnya, use keywords and spring. Floor house made into three levels according to the order of the descendants of the people of Palembang, the raden, masagus, and kiagus. Part in the guest room, which is called kekijing, in the form of a yard wide. The center of this room, if there is activity in the assembly. Room at a time to be a "showroom" to show the home owner prosperity. Palembang is well with the dance and song with the Gending Sriwijaya wearing clothes that called Aesan Gede, Selendang Mantri, paksangko, Dodot and Tanggai. the same as the clothing worn by bride, dancers always be under guard core of two other dancers to bring an umbrella and spear. Are on the back of the Sriwijaya gending performers, music suite consists of gamelan and gong .. The front of the dancers take it as a Foreword to be devoted to the special guests who came, accompanied the two dancers who bring pridon made of brass. The Foreword is originally only done by girls king, sultan, or noble. Pridon bearer is usually familiar wet nurse educator or the daughter. and many more types of dance palembang. Better known by the name Aesan gede, Selendang Mantri, paksangko, Dodot and Tanggai, combined with a motif fabric songkets various users in accordance with joy. Usually, this dress worn by the family of kings or high officials in the that. Clothing is very high value both in terms of materials, patterns and prices. The material is made from a majority of the gold. .